Empire Mine State Historic Park (EMSHP) is in Nevada County, California. The site is managed by the Department of Parks and Recreation and includes a visitor center with historic mine and mill buildings that serve as a museum for park visitors, as well as parking and picnic areas. In addition, 14 miles of trails throughout the park are used for hiking, jogging, biking, and horseback riding. Historical mining activities took place on the site for 100 years, leaving abandoned mine and mill operations throughout the park, and large piles of waste rock. More information is available in the site remedial action assessment (Newmont 2013). The bioavailability assessment completed for this site was part of a seven-year study by the Department of Toxic Substances that was funded by USEPA with the goal of developing a new in vitro method to accurately predict in vivo results. 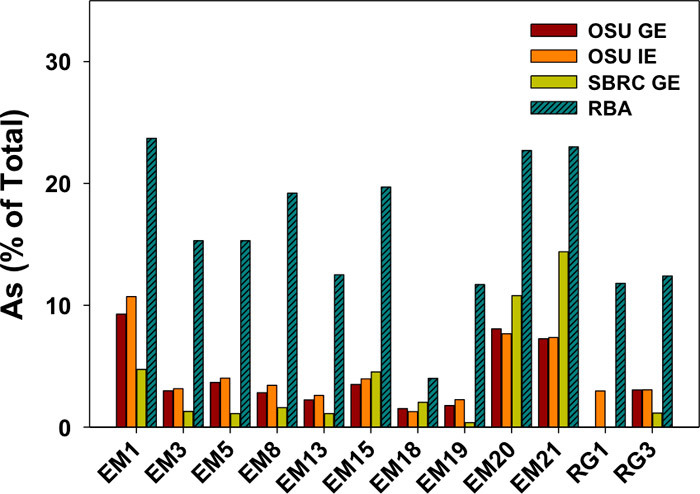 This work was needed because the existing IVBA methods consistently under predicted the in vivo RBA for California’s mining soils, which are rich in iron oxides. While the study generated a wealth of information for this site and a new method was developed, the in vitro data were not used in the decision-making process because the study results were not available until long after the site remediation had been completed. The local background of arsenic at the site is 121 mg/kg. The focus of the bioavailability study at EMSHP was to evaluate the arsenic in many of the large waste rock piles throughout the park. Of the 13 sites evaluated, pile sizes ranged from 1,640 cubic yards to 87,000 cubic yards with a total of 402,900 cubic yards of contaminated soils. Total arsenic concentrations ranged from 10 to 15,300 mg/kg; the 95% upper confidence level (UCL) of the mean calculated for each location ranged from 244 mg/kg to 10,250 mg/kg, all of which exceed the natural background of arsenic for this site. The soils at EMSHP are high in iron oxide content and consequently appear orange/red. Historical gold mining activities resulted in the arsenic contamination on site. Exposure to site soils is primarily due to recreation. Each site was classified as being in either an easy, moderate, or difficult access area. Site-specific exposure factors were developed for each of these exposure scenarios. The key component that differed between exposure scenarios was the exposure frequency (number of days accessed per year: 25, 12, or 1, respectively). Soils were prepared for analysis by sieving down to the less than 250 µm fraction. This size was chosen because it is the size of soil particles that are assumed to adhere to hands and therefore be available for incidental ingestion. Soils were evaluated using both in vitro and in vivo analysis. Dr. Stan Casteel at the University of Missouri evaluated the soils using the juvenile swine method (Casteel et al. 1996). Soils had a predicted relative oral bioavailability (RBA) ranging from 4% to 24%, with an average of 15.5%. Dr. Casteel is the principal investigator who developed this method, which adds a degree of confidence to these results. These soils were further analyzed to help establish a new in vitro model that could accurately predict the in vivo data. This work was completed by Dr. Nicholas Basta at Ohio State University, a leading researcher in this field. Several existing in vitro methods were compared to the in vivo data as shown in Figure 11-2. These methods included the OSU In Vitro Gastric Extraction (OSU-GE) and Intestinal Extraction (OSU-IE) as well as the Solubility Bioaccessibility Research Consortium Gastric Extraction (SBRC GE). 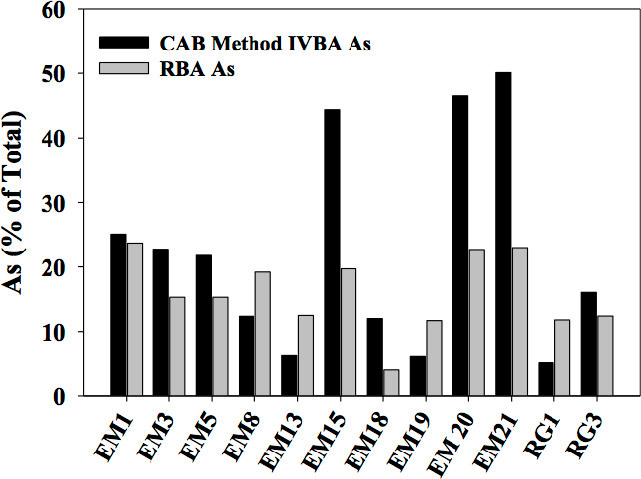 As demonstrated, the existing methods consistently under predicted the in vivo RBA data. A new method now termed the California Arsenic Bioaccessibility (CAB) method (Whitacre et al. 2017) was developed as a part of this work and those results are presented in Figure 11-3. The results demonstrate that the large under extraction of arsenic by the OSU-IVG and SBRC methods has been corrected with the parameters of CAB method. The CAB method, however, extracted more than RBA arsenic in some soils (EM15, EM18, M20, and EM21), thereby negating potential bioavailability adjustments as IVBA arsenic approaches the 60% bioavailability default for site assessment (USEPA 2012d). Note that these four soils contain the highest arsenic levels of all the study soils (5,647–12,095 mg/kg). As a result, the CAB method may not be suitable for accurate estimation of RBA arsenic in soils with total arsenic greater than 1,500 mg/kg. The CAB method, however, closely brackets RBA arsenic in Empire Mine soils with low to moderate arsenic content. Soils had a predicted relative oral bioavailability (RBA) ranging from 4% to 24% with an average of 15.5%. For risk assessment purposes, a conservative RBA of 25% was used for all waste rock sites. This value was used as multiplier in the calculation of soil ingestion. The results of the risk assessment are included in Table 11-2. More information about using site-specific RBA values in the risk assessment calculations is presented in Using Bioavailability in Risk Assessment. 11.1.5 How Did Bioavailability Results Affect Site Decisions? Site- specific recreational exposure scenarios were used in conjunction with RBA values based on in vivo data to demonstrate that the risks on site were within the USEPA risk range of 1×10-4 to 1×10-6. In the absence of RBA adjustments, the risks due to arsenic at Prescott Hill would be more than 1×10-4, requiring some remedial action of the 30,000 cubic yards of soil and waste rock. The project manager on this site decided that the calculated risks as demonstrated in Table 11-2 were acceptable. No remedial action was required for these waste rock locations. Other considerations included that the sites contained a large amount of plant or forest litter that covers greater than 50% of sites. Additionally, most of the sites are large waste rock piles, as opposed to the fine-grained soils sieved out and analyzed for total arsenic and site-specific RBA values. 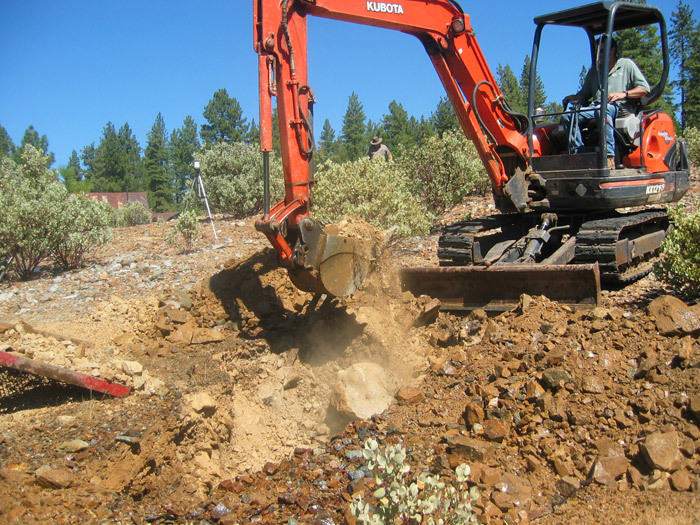 This site is unique because the investigation was completed as part of a USEPA-funded grant to DTSC to evaluate bioavailability of arsenic in mining soils. DTSC was the lead agency in designing the study and conducting the work. All work on the site was done with the cooperation of the California Department of Parks and Recreation. Given the historic value of the site, an archeologist was also present for the collection of soils. Site decisions were made based solely on the in vivo data because the development of the new in vitro method was an ongoing activity and the resulting data was not available until years after the initial in vivo work was completed. Community outreach on this site included a DTSC presentation entitled “Alternative Methods for the Evaluation of Arsenic Bioavailability: Reclaiming Mine-Scarred Lands While Protecting Human Health,” given at the 2012 Reclaiming the Sierra Conference sponsored by The Sierra Fund.